Yoga series from Lenovo are a set of convertible devices. Along with Yoga 910 Lenovo featured another device namely Yoga Tab 3 Plus. The new device is launched with much more upgraded features. It seems that Lenovo wants their users to enjoy multi-media to its maximum with Yoga Tab 3 Plus. Let’s have a look onto the features of newly launched Yoga Tab 3 Plus. Yoga Tab 3 Plus measures to be 247*179*4.68mm with a weight of just 637 grams. This premium tablet from Lenovo comes with uni-body metallic case. Yoga Tab 3 Plus is having a display that extends upto 10.10 inches with a screen resolution of 1600*2560 pixels. The display is well versed to support 2K and is having 299 PPI. 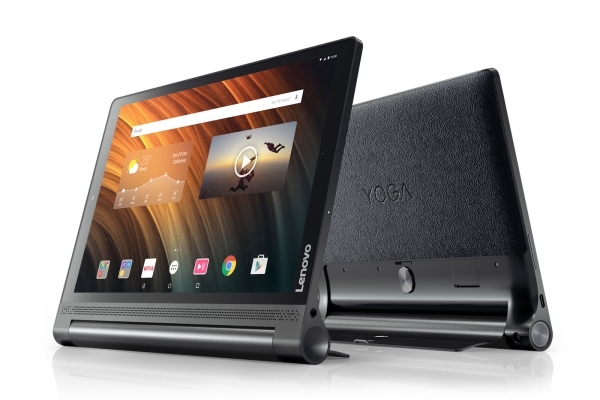 Yoga Tab 3 Plus from Lenovo is featured by four JBL Speakers along with Dolby Atmos Certification. This ensures that the users enjoy multi-media with much sound quality supported by top class video clarity. Lenovo Yoga Tab 3 Plus is functioned with the help of Qualcomm Snapdragon 652 Octa Core processor. This processor comes with four Cortex A72 with a processing speed of 1.84GHz and another four Cortex A53 that speeds at 1.2GHz. The tablet is having a RAM of 3GB along with an internal memory of 32GB. The storage can be extended upto 128GB with the help of external microSD memory card. Yoga Tab 3 Plus supports Android v6.0 Marshmallow. Yoga Tab 3 Plus is having a main snapper with 13MP to its back, which ensures quality snaps. The front snapper is having 5MP, with which you can capture lovely selfies. Yoga Tab 3 Plus supports WiFi connectivity with 802.11ac. It also supports GPS. In addition Yoga Tab 3 Plus has sensors like Proximity, Accelerometer and Ambient Light Sensor. Yoga Tab 3 Plus is integrated with huge battery with a capacity of 9300mAh. It is guaranteed by the company that this battery will provide a power back-up that lasts upto 18 hours. Yoga Tab 3 Plus comes with a price of $333. It will be available in markets by the end of November. The initial turn-up will be limited to Europe in the first phase. But Lenovo hasn’t officially declared the markets to which Yoga Tab 3 Plus will be released next.